Hi everyone! Yay! 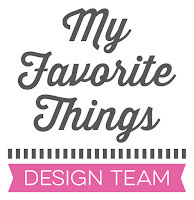 It’s time for the My Favorite Things February product launch! Today, you can see all new products and they are available right now on the MFT online store! I created this cute little scene using a lot of new products! I started by sponging Broken China Distress ink to the background. I then die cut a window with the Inside & Out Stitched Rectangle STAX. I die cut the grassy border with the Grassy Fields Die-namics from Sour Apple cardstock and sponged the top with Cactus dye ink for more depth. Next, I die cut the Farm Fence from white cardstock and sponged it with brown Distress inks. The little cloud is from the Puffy Clouds Die-namics set. The rainbow was die cut with the Stitched Rainbow Die-namics from several MFT cardstock: Ripe Raspberry, Orange Zest, Daffodil, Limelight, Blu Raspberry and Grape Jelly. Finally, I colored the horse from the Farm-tastic stamp set with Copic markers and die cut it with the coordinating die. To finish off my card, I stamped the sentiment also from the Farm-tastic set and attached everything together with tape and foam pads. What an adorable little scene you've created! Love the cute little horse! I just love this card with that cute little horse. It is such fun! Lovely card, very amusing and great colouring. I love the stitched dies you used on this card. Great for children cards. The rainbow of MFT card stock is beautiful! I love your bright and cheery rainbow card. Such a fun little get well card. It will surly bring a smile to the one that receives it. Such a cute card! At first, I didn't think I needed the rainbow die, but I MUST have it! Thank you for the inspiration! Such a sweet little scene Francine. Love the die cut window with the details in behind it. Absolutely love the little scene you created! Love this! It just makes me smile! Super cute card - makes me smile! Wow! Love your bright and fun card! Love how you used so many different die-namics to create the scene. The coloring on your horse is amazing! Thanks for sharing. Love the new products and the great inspiration you provide!! So cute! I really love how you colored the cloud! It is fabulous! 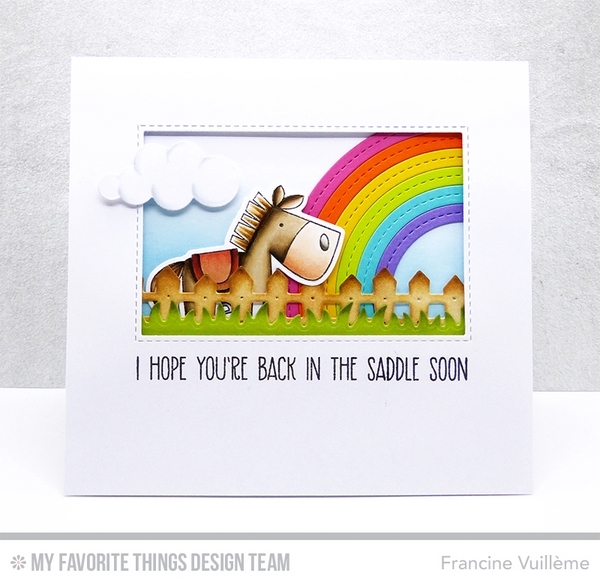 I really like your Copic coloring of the sweet little horse ... what a fun scene you've created with all the new products! Great combo of the rainbow die and the farm stamps. Cute card. Love the little scene you've created. Such a beautiful card. Another great release. The rainbow really adds to the get well wish! LOVE your card, that horse is sweet and your rainbow is so colorful....and that fence die--that was my favorite die of the Release--must have!!! Cute card and great rainbow colors. So sweet. I especially like your rainbow and the sponged sky. That sentiment is great! I adore your bright and happy card! Awesome & colorful & cute card. Cute card, would really brighten a day for someone not feeling well. I just love the stitched rainbow die! This scene is super sweet! Love the look of this card. Who couldn't feel better when receiving this??? Such a cute card and so colorful. This is such a cute Feel Better card. Your horse is darling. What an detailed scene with all those amazing dies! great card. Wonderful farm scene you created, love it! OMGEEEeee! This scene card is FABULOUS! Bravo! Great scene and wonderful colors. A gorgeous card! Love the adorable little horse & that fantastic rainbow!! What a lovely, cheerful card! Great design! Bright, fun and encouraging! ACK!!! So cute!! I love your layout and the little scene you created. LOVE!!!!! I love this card! so adorable! Adorable card! Love the rainbow! Love how bright and adorable this card is. Fantastic work!! This card is absolutely wonderful - love the crisp clean design and colors! Oh My Gosh! I love your coloring skills! That horse is just so darling! What a beautiful card! Thanks for sharing! This is so cute! You are the best at creating cute little scenes!! So very very cute! TFS! Such fun...what a cute scene with the little horse...love it! Adorable dsign Francine! TFS, have a lovely day! Love this cute cheery scene you created.